Mark McCaw, Shift Supervisor at Liverpool John Lennon Airport has again delivered outstanding customer service and went the Extra Mile with a simple act of kindness and compassion which helped a lady who needed assistance. This is Mark’s second commendation from members of the public in the course of his duties at Liverpool John Lennon Airport and he is an absolute credit to Aston Services Group and to the airport. 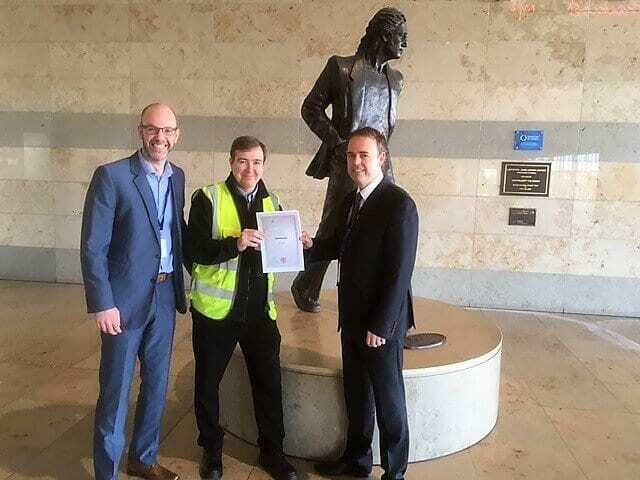 The picture shows Mark being presented with his award by Alistair Clayton, Commercial Director, Aston Services Group and Dave Briggs, Head of Customer Care at Liverpool John Lennon Airport. Please see below a copy of the note received from the family concerned. On the 5th of January my wife landed at Liverpool airport, and found that her phone would not work, she asked one of your staff if she could borrow his phone he said, of course, she could and he refused to accept any money for the two calls she made to Lisbon. The staff members name is Mark McCaw from clean all please thank this man for us, He saved my wife from a lot of distress he went way beyond the call of duty.